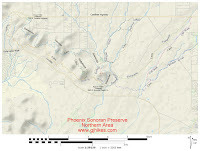 The Ocotillo trail is located in the northern section of the Sonoran Preserve in Phoenix, Arizona. 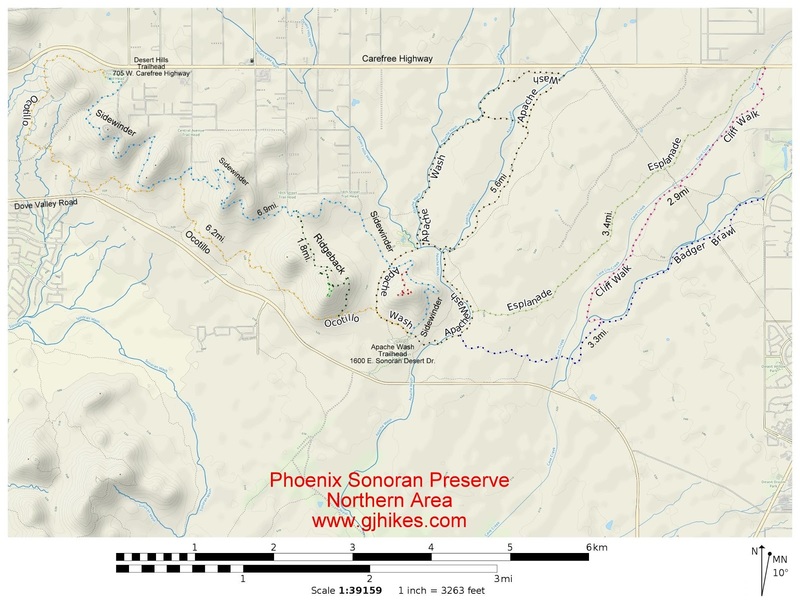 The trail travels along the foothills of a long ridge between the Apache Wash and Desert Hills trailheads. Enroute it provides connections with the Sidewinder, Apache Wash Loop, Ridgeback and the West Skip Rimsza Paseo trails. Ocotillo can be combined with the Sidewinder trail to create a 13.2 mile loop. This post begins at the Apache Wash trailhead at 1600 E. Sonoran Drive and ends at the Desert Hills trailhead at 705 W. Carefree Highway. The trail starts out with a mostly smooth hard packed surface as it leaves the trailhead. Near the 0.4 mile point it passes a junction where the Apache Wash Loop connects on the right. From there the trail climbs up the shoulder of a hill and near the 3/4 mile point passes the spot where the Ridgeback trail branches off on the right. The trail is a little rocky through here but for the most part there is a smooth track that can be followed. As the trail works its way around the mountain it levels off somewhat as it continues westward. There are plenty of dips along the way as it works its way in and out of various washes. In several places there are short spurs that connect with the West Skip Rimsza Paseo trail which is a concrete route that travels along Sonoran Drive. Going in this direction the trail has a general uphill trend to it. For those that are unfamiliar with the local desert flora an ocotillo is a plant that is indigenous to the desert southwest. In Spanish the name translates to 'little torch'. The long spiny stalks leaf out whenever there is moisture and during the springtime there are fiery red clusters of flowers that bloom at the end of the stalks. As the trail works its way around the hills it meets up with the Sidewinder trail again around the 2.8 mile point from the Apache Wash trailhead. The two trails share routes for the next quarter mile or so before the Ocotillo trail branches off on its own once again. Around the 4.5 mile point the Ocotillo trail begins a climb that will take it around the west end of the ridge of hills. The climb is mostly moderate other than a couple of short steeper stretches. After rounding the end of the ridge the trail turns back toward the east for the last half mile until it reaches the Desert Hills trailhead and comes to an end. We were riding the 13 mile loop so after a brief stop we continued on the Sidewinder trail to get back to the Apache Wash trailhead. Another option would have been to turn around and return the way that we came where the trail would have been mostly downhill. The map will come in handy with planning even more possible routes to take. As far as the Ocotillo trail goes, it is scenic and a pretty good workout on a mountain bike. If you would like to see it for yourself then all you have to do is grab your bike or 'Take a hike'.